Climate Common Sense: Travesty Trenberth attacks real scientists! Would you however go to a doctor death who had been proved wrong in most of his diagnoses, who falsified results and prevented good doctors from examining the patient for an accurate diagnosis? Because the "travesty" statement is a matter of public record and the "lack of warming" is factual and agreed by skeptics the unfortunate Trenberth is defending the indefensible and on this subject his credibility is zero. 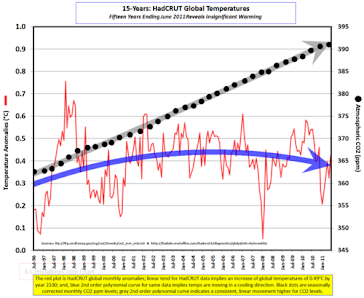 Climate experts know the long-term warming trend has not abated in the past decade. In fact, it was the warmest decade on record. Observations show unequivocally our planet is getting hotter. A cardiologist with the same level of analytical ability looking at his patient's charts would be sending them home in body bags! I think it's time that those of us who understand scientific principles stopped being called climate 'skeptics' (or the English spelling) and started being called *realists*. It's the fanatical climate zealots claiming that the sky is falling who are out of step with ordinary natural reality. A) Why not show a 30 year graph instead of a 10 year graph? The 30 year graph would show a DISTINCT UPTREND. Better yet, show a graph since 1900. B) If you added 2009, 2010, and 2011....you would see that the 11 year period has recovered to its highs. There has been NO drop-off. Only Joe Bastardi would show a graph in 2012 with data that doesn't include 2009, 2010, and 2011. C) Joe Bastardi was WRONG in Sept 2010 when he said the Arctic ice extent would rebound and start expanding. Instead, it has CONTINUED to reduce. This year (2012) is headed for what will likely be a record low ice extent. 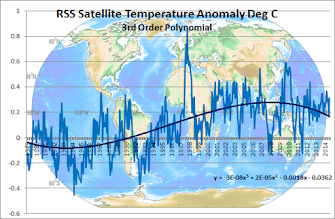 Even the discredited Phil Jones has said that there has been " no warming" for 15 years. The thirty year graph you want starts from a time when the same idiot climate "scientists" thought we were descending into another ice age so of course it would show warming. The fact is we are entering a down trend at the moment. Arctic sea ice has only been measured by satellite from the 1970's and there have been numerous reports of it being much less than it was in 2007. The scammers would like us to ignore these earlier periods the same way they have erased the MWP. Globally sea ice is now at a normal level .